It's rare that a sequel tops—or even equals—a beloved original, but while this followup to the Oscar winning 2006 animated hit may not be the fresh, delightful discovery of the first, it holds its own and overall is even better than the first. Returning to the familiar Antarctic landscape of Happy Feet and taking with it several of the original actors including Elijah Wood and Robin Williams, this sequel adds on some winning new characters including a couple of hip krills played by Brad Pitt and Matt Damon plus a new plotline about an environmental catastrophe. This new round of toe-tapping musical numbers from the penguin population is shot in eye-poppingly gorgeous 3D and guarantees some very sweet holiday box office returns for Warner Bros. DVD and ancillary formats should equal or exceed the original's popularity, too. Director George Miller (Mad Max, Lorenzo's Oil, Babe) continues his current career foray into animation and successfully recreates the charm of the first film while folding in a genuinely exciting plotline that has a strong message about the importance of community. Tapmaster Mumbles (Elijah Wood) is back but has a big problem: his young son Erik (Ava Acres) has two left feet—literally. So the dance-hating boy goes on the lam where he encounters the very cool Mighty Sven (a hilarious Hank Azaria)—a penguin who can actually fly—but Sven's gift is just another downer for Erik who has severe self-image problems. And then things get worst when a giant landslide traps most of the population in a massive gorge. Among the animals in peril are an elephant seal (Anthony LaPaglia) who finds himself hanging on without a net while trying to keep his own little kids calm, and a couple of singing krills named Will (Pitt) and Bill (Damon) desperate to be individuals in a dense school of their own kind. Pitt and Damon, both fathers, throw themselves into the roles with pure abandon—they're the film's brightest spot. The screenplay by Miller, Gary Eck, Warren Coleman and Paul Livingston offers plenty of comic opportunities for Williams who again voices both the advice-giving Lovelace and the suave lover Ramon. There's another sultry penguin with the coo of Sofia Vergara, and now Gloria, Mumbles' wife, has the sound of the singer Pink, who replaces the late Brittany Murphy. Miller ably uses the 3D to enhance the stunning visuals with a depth not possible in the first film, and John Powell's score simply soars. As for the songs, David Bowie's "Under Pressure," is perfect when things get dire. A couple of sequences may be too intense for the younger members of the family, but overall it should be smooth sailing for parents. 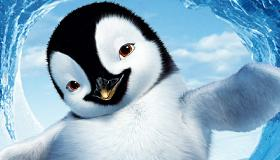 Happy Feet Two is reason to be happy, indeed—it's the complete holiday movie treat. Screenwriters: George Miller, Gary Eck, Warren Coleman, Paul Livingston. Producers: George Miller, Doug Mitchell, Bill Miller.